Teachers wish their lives away. Only three weeks to go until holiday! Once school reports are done we’re at the business end! Only two months until the Christmas concert! You need to have that Writing project in by Wednesday! Hump day – bring on the weekend! How long until those corrections need to be done? How many weeks to go until end of term? It’s true, if we’re not counting down to something, we’re most likely asleep. Teachers: true party animals…until 9:30pm. When the school term starts we focus on pre-tests, KWLs, ISPs, KWSs (and any other acronym you can think of) to find out what students know about an upcoming unit of work. We create term overviews, forward planners, daily schedules and specific calendar entries so that we feel like we are truly prepared to begin the juggling act that is school life. The term moves into the second and third weeks. We’re well and truly head first into projects and topics that must take action in the near future.. Okay, we’re half way through the term now. Those pre-tests and other things we did earlier in the term are telling us our kids still don’t know certain things. There’s only 5 weeks of school to go, time to get moving. Five weeks left? That’s 25 maths lessons….I’ll dedicate 10 minutes at the beginning of each lesson to really hit home some strategies on factorising, halving and doubling. Is that enough time? Sure. Yes? No? Oh God, I don’t know! Wait, but reports are due during that time of term. We also need to start those extra practices for the school concert on next term and track how our kids are progressing…better get another batch of KWLs, ISPs and KWSs ready. Suddenly, life disappears around you and it’s Christmas already. Seriously? Christmas is actually nearly here? I don’t know about you, but that’s usually when sheer, absolute terror that I haven’t done nearly enough for my students kicks in. Except, this year seems to be different. This year I was lucky enough to be schooled by kids. Kids are amazing at enjoying the then and there. Mr Steele, it’s called mindfulness. We’ve already spoken about this. Seriously. What’s crazy is that they are doing this most of the time and we either miss it or choose to ignore it. This year I was lucky enough to start noticing it and it really is incredible. It doesn’t take much and don’t get me wrong, there are definitely still moments when I move to my panic stations, ready to hit the emergency buttons, but then I stop and choose to find something fun, simple, different or amazing around me. Yesterday it was stopping for 20 seconds to look at this massive tree on our school oval bend and twist in some high winds – it was ridiculous how far it was shifting. Not the actual tree, but you get the point. Whilst I then had to turn back to my huge pile of corrections, planning and preparation for 2017, it didn’t phase me nearly as much. In fact, I was actually more switched on and got through the work quicker than usual – all because of a 20 second break. Stopping and finding that little bit of amazement does wonders*. The key is to keep remembering to stop and look for them. 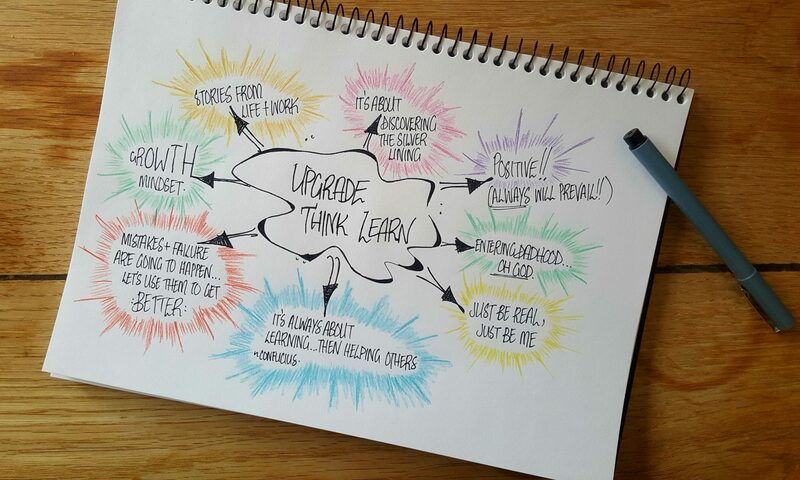 *Here at Upgrade Think Learn, we highly recommend starting with clouds. You can pretty much see anything in those sky high legends…if you give yourself a little bit of time to. Enjoyed this post? Think teachers are great? Like sign up forms? Well then, we have a perfect thing for you- sign up and join our digital community today!